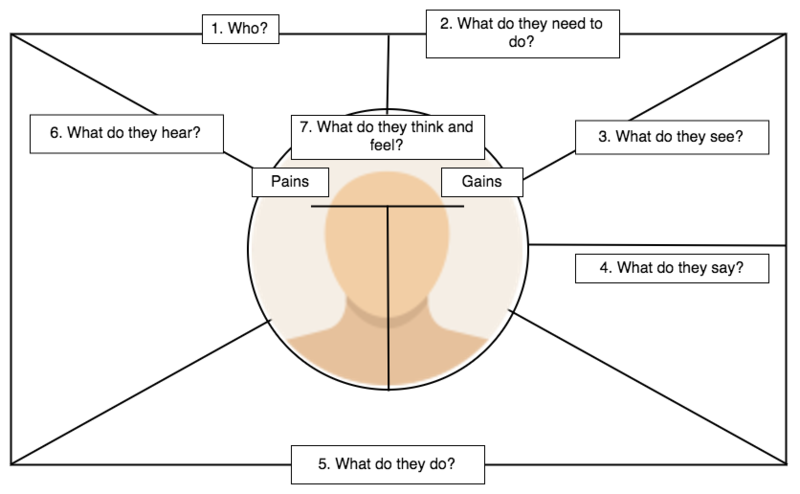 In a recent webinar that I delivered for the British Council on Emotional Intelligence and Coaching, I introduced the concept of Empathy Mapping. 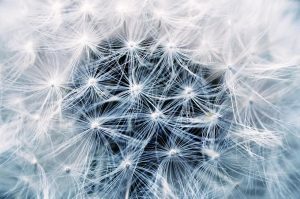 This caused quite a stir and many people were quite excited by the prospect of having a tool that enabled the development of empathy, although for many the empathy mapping process was hard to grasp within the confines of a webinar. So in this post, I’d like to expand on some of the aspects of this tool and how to use it. Firstly, why empathy? There are many reasons why we would all benefit from developing a little more empathy. Empathy is defined as ‘the ability to understand and share the feelings of another.’ This is something that’s becoming increasingly necessary in a world that seems polarised by intolerance and a lack of cultural understanding and sympathy. Having a greater sense of empathy with an understanding of the people around us can also help us to develop more productive and positive relationships and help reduce personal conflicts. Within our more closely defined context of the teaching and teacher training classroom, a greater sense of empathy can help us understand the challenges of our students and trainee teachers and help our students better understand and empathise with those around them. The process of empathy mapping has an unlikely origin in product development and was originally designed to help companies understand the needs of their customers (See Gamstorming: http://gamestorming.com/empathy-map/ ), but can very easily be adapted to the teaching and training classroom to help us better understand the people we are working with, their pains and their motivation. So this is an empathy map and this is how it works. To use the map you should move around it from 1 to 7 trying to understand your subject and fill in the relevant information. You should decide who it is you want to understand and empathise with. This doesn’t have to be a single person, though it can be very useful if you have particular student or trainee that you find challenging or who needs extra help, it can also be a group of people or a persona. So for example, if you are planning a training course you could use it to start understanding the needs of your trainees as a group, before getting to know them better as individuals. At this point, you need to think about their goal in relations to your course, what they do, what they need to do and what they need from you. At this point you need to think about what they see around them in relation to this goal, so, for example, an English student may see other people with better English getting better jobs. An experienced teacher may see more teachers and students using technology and be influenced by this. Try to think of as many things as you can that could be influencing them in relation to their goal. At this point, you need to think about what they are saying in relation to the goal. What are they saying to you and what are they saying about their goal to others? What can you imagine them saying? At this point, we need to think about what they do. What kinds of behaviour have we observed them doing? What do they do that they may want or need to change? What can we imagine them doing in their day to day context? At this point, you need to think about what they are hearing others say. What are their colleagues and friend saying? What do they hear ‘second-hand’? Finally, at point 7 you should be able to pull all this information together and it should inform you about the fears and frustrations (Pains) and their hopes, dreams and beliefs (Gains) for the future. We can use the empathy map in a number of ways. You can use it to better understand either the individuals or groups you are teaching or you could use it with a particularly challenging student, to better understand the causes of their behaviour. We can also use it as a learning tool for our students and get them to create empathy maps. They could create empathy maps about the characters in the stories or literature they are reading. In longer texts, they can gradually build the empathy maps for each of the characters in the story as they gather more information. We can get students to create empathy maps about people in the news to help them better understand the world around them and the motivations people may have for the things they do. Whether we like or agree with the things the people around us do, having empathy and greater understanding for why they do things will help us and our students better understand the world and so be better able to deal with it and so influence change in themselves and the people around them. Empathy is a theme that I’m continuing to explore in a new series of image-based lesson plans. This text has been adapted from the chapter on conceptual models in my ebook – Digital Tools for Teachers – Trainers’ Edtition. It’s one of a number of models presented in the chapter that can be used to underpin a sound application of technology within education. Connectivism is a theory of technology integration that has originated and is unique to the digital world. 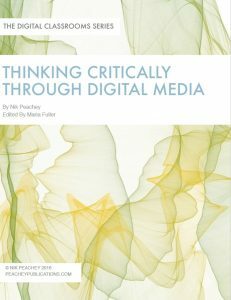 Connectivism originated as an attempt by Steven Downes and George Siemens to understand and define the ways in which learning naturally occurs in the digitally connected and socially networked world. 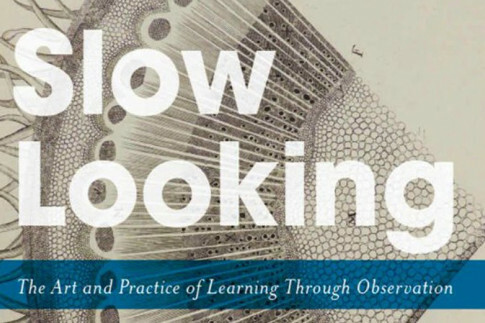 The theory has huge implications for the development of autonomous learning as well as online learning and has been used and misused to support the construction and implementation of a generation of MOOCs (Massive Open Online Courses) and MOOC platforms. When thinking about our use of technology in education we can use these principles as a guide to evaluate the effectiveness of our tasks and activities. We can look at the ways we are encouraging and guiding our students in the use of technology to ensure we are helping to reinforce the understanding and practice of these guiding principles. 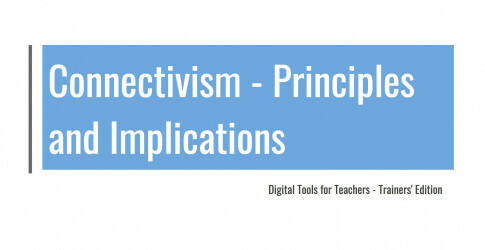 The training presentation below has an introduction to connectivism, some suggestions for how we respond to each of the principles and some reflection questions for teachers. This video is also useful in enabling teachers to understand the changing role of the teacher as more students develop a connectivist approach to learning. 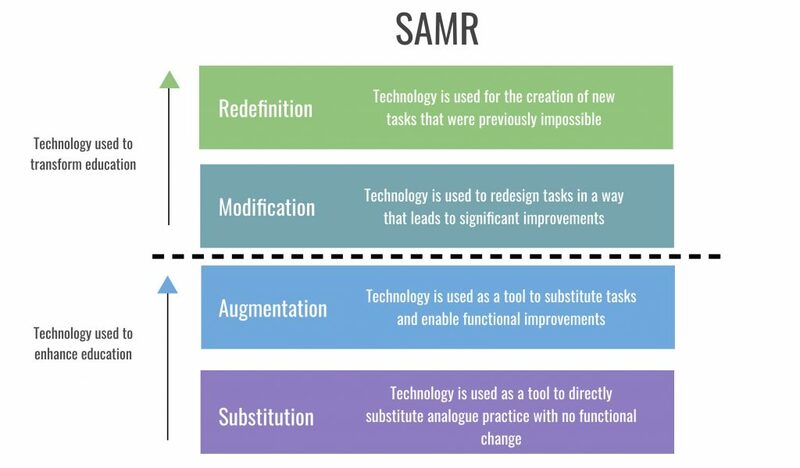 SAMR (Substitution – Augmentation – Modification – Redefinition) was introduced by Dr Ruben Puentedura in 2006. SAMR is a paradigm for understanding how we can integrate technology into education, though with the proviso that if we want to use technology in a way that is truly transformative we should be aiming to develop tasks and activities that are more towards what it describes as the ‘modification’ and ‘redefinition’ parts of the model. Understanding the paradigm can help us to analyse the way we are using technology and to think about how we can evolve the way we use it, from the more superficial ‘substitution’ type tasks to ones that redefine the way students interact with content, each other and the teacher. Here are the four ways it classifies the application of technology along with an example of how a task could be developed through the understanding and application of this process. – Technology acts as direct substitute with no functional change. The task remains the same but a computer is used as part of that task. E.g. Find a text online to use in place of one of the texts in your course book. 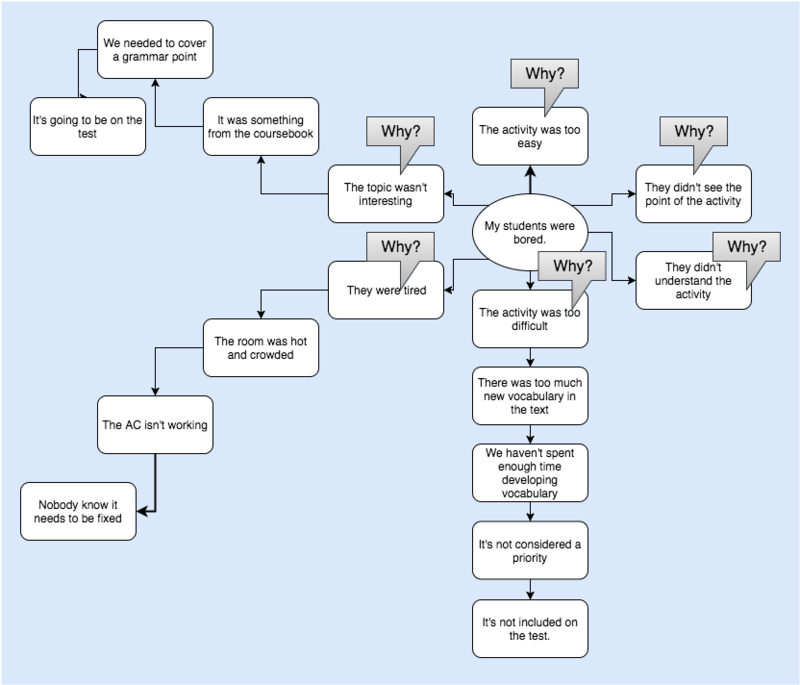 Ask your students to read it and answer comprehension questions. Augmentation – Technology acts as a direct tool substitute for an analogue activity, but with functional improvements. E.g. Find a text online to use in place of one of the texts in your course book. Ask students to use some digital tools to mark up the text with notes, highlight specific areas to remember and use an online dictionary to check new vocabulary. – Technology allows for significant task redesign. E.g. Find a text online to use in place of one of the texts in your course book. Ask students to use some digital tools to mark up the text with notes, highlight specific areas to remember and use an online dictionary to check new vocabulary. Then ask students to share their reflections about the text on a blog which is shared within a wider educational community. They then comment on each others’ posts. They later meet together in a virtual live forum to discuss and debate the content. – Technology allows for the creation of new tasks previously not possible. E.g. Find a text online to use in place of one of the texts in your course book. Ask students to use some digital tools to mark up the text with notes, highlight specific areas to remember and use an online dictionary to check new vocabulary. Students then work collaboratively to research the background to the text online and create a digital survey about it. They share the survey through social media. They then collect and analyse the data from the survey and work together online to create an infographic or video report of their analysis of their survey responses. Approaching technology with this kind of awareness can certainly have its benefits and SAMR has definitely attracted quite a following. You can use this presentation from Digital Tools for Teachers – Trainers’ Edition to train other teachers and encourage them to reflect on their use of technology. 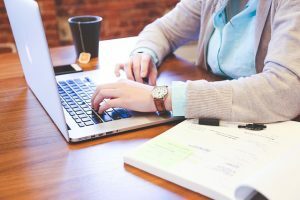 In the first part of this series on e-safety for teachers I looked at some of the general dangers out there for anyone online and a few of the things we can do to help students avoid them. In this second part I’d like to look at what we can do to ensure we are not bringing the dangers into the classroom with us through the sites we use with students. We should take responsibility for the sites that we recommend to our students. Of course we should check the appropriacy of the content and any advertising they may be carrying, but there are a range of other things that could also alert us to potential dangers. It’s important to stress the word ‘potential’ here though. The internet is a resource that was initially developed by enthusiasts, so many perfectly legitimate and valuable sites that were put together by people working in their own time might throw up one or more of these warning signs, conversely all of these could be present and correct, but that doesn’t 100% guarantee that the site is ‘safe’. Check the URL of the site and see if it begins with ‘http’ or ‘https’. The ’s’ on the end stands for secure and means the site has been registered with a security certificate to confirm that all information that travels between your browser and the site is encrypted . This is a good indication that the site is legitimately registered and less likely to pose a security threat. Never make financial transactions on a site that doesn’t have https.Google provides a useful tool for checking whether sites have been flagged up as potentially insecure. Just go to: https://transparencyreport.google.com/safe-browsing/search paste in the URL and Google will share what it knows about the site. Look for the physical address of the company creating the site. If it is a legitimate company and involved in any kind of business transactions the physical address should be visible, usually on the ‘about us’ page. 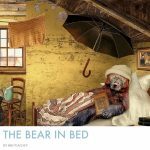 Bear in mind though that many sites are put together by enthusiasts and they might not want this level of exposure, especially if they work from home. As with the address, most companies will offer some form of contact information for their customers, whether this is a phone number, email address or contact form. It may be worth checking to see of this does actually work if you have any suspicions about the legitimacy of the site. Again you are likely to find this on the ‘about us’ or ‘contact us’ page. If the email address is a generic, like Yahoo, Hotmail, Gmail, etc. you might want to look more closely at the site, whereas a dedicated company email address is a more positive sign. Check out the ‘’about us page to see if the site offers information about the people who produce it. See if this looks legitimate and authentic and whether the profiles look like genuine people. How do the site owners use and protect your personal information (email address, etc.)? What information do they store and why? What ownership, if any do they claim / retain over the information or content you or your students create? If they require registration through a social media platform, what access does it give to them to the information about your profile and the profiles of your friends and connections? If reading through all of this information starts to make you nervous, then please keep in mind that the vast majority of websites and applications created are absolutely legitimate. I have been using the internet for educational purposes for more than 20 years now, without any great sense of caution, and have yet to encounter any situation that couldn’t be dealt with through either simple blocking of individuals or good antivirus software. This text is the second of a two part series adapted from my ebook – Digital Tools for Teacher – Trainers’ Edtition. 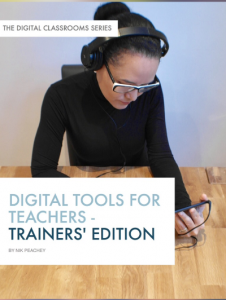 This text is the first of a two part series adapted from my ebook – Digital Tools for Teacher – Trainers’ Edtition. 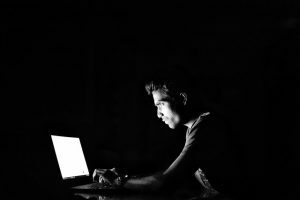 In this first part I look at potential online dangers and how we can help students deal with them. 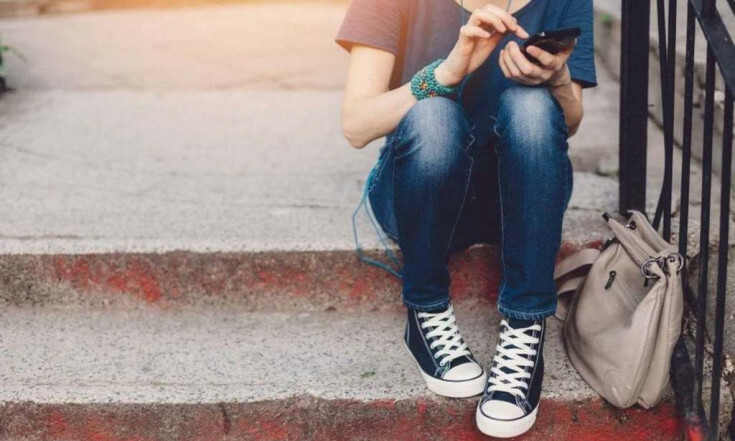 Increasingly, as teachers use and guide students to use web-based and mobile applications we are faced with the responsibility of ensuring our students’ safety online. In this chapter I’d like to look briefly at some of the issues involved and attempt to put these into realistic perspective. Please bear in mind though that these are my opinions based on my perspective and experience as someone who has spent two decades working in online education. These are not the views of a cyber security expert. To be honest I don’t really believe there is any such thing as 100% online privacy. Even the FBI has been hacked. This isn’t necessarily a bad thing as long as you use the internet with an awareness that anything you do, see, create or store online could potentially be seen by others. You wouldn’t walk through a crowded market place in your underwear shouting out your secrets and sharing your address, bank details and pictures of the people you love, and expect it to remain a secret, so don’t expect to do it online. 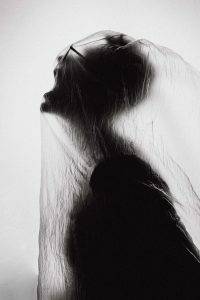 If you want to keep something private, keep it in your head, never write it down, don’t tell anyone about it and make sure you don’t talk in your sleep. If you and your students enter the online domain with an awareness of this and only post things that you are comfortable having in the public domain then you should really be fine. 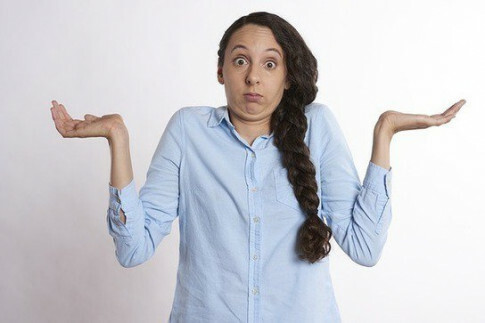 Having said that, most web-based social media platforms and educational platforms do have some form of privacy control that limits who can see what, within and from outside the platform, and processes for reporting abuse, so do make sure you and your students are aware of how these work and put them to good use. 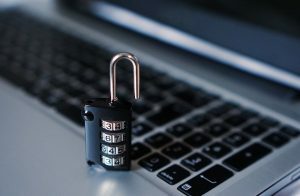 These are among the most common of online problems, especially in places such as schools, libraries and internet cafes, where access to a computer is shared and people are using things like USB drives to store information. These problems are also reasonably easy to avoid, if you make sure that you have antivirus software installed and keep it regularly updated. Also, make sure that you have a firewall on your computer and it’s turned on. It’s undeniable that the potential for students to find inappropriate content, either deliberately or accidentally, is ever present. There are a number of ways of dealing with this including filtering and monitoring software of various kinds. None of these are 100% foolproof, so don’t rely too heavily on them especially if you are working with younger learners. The best way to deal with this problem is to design purposeful tasks with clear instructions and then monitor carefully to make sure students stay on task. Having some form of device or network monitoring software can help with this, but if you do so, it’s wise to make students aware that you can see what they are doing, as it’s better to discourage a problem before it occurs rather than have to deal with it after it has happened. Make sure that your school has a policy regarding cyberbullying and a process for reporting and dealing with it. Also make sure that your students know what this policy is, both in terms of how to report it and what the consequences will be for the students who do it. Make sure students know what does and does not constitute harassment. In many cases, students just aren’t aware of the harm they are causing and think that they are being witty or funny. It’s actually much easier to track, prove and trace back online behaviour to the person responsible in the virtual world than it is in the physical world. It’s extremely difficult to carry out any online action without leaving some form of digital footprint. Make sure students know how easy it is to get caught if they are bullying or harassing someone. This is likely to reduce the chances that anyone will do anything irresponsible and greatly increase the chances that anyone being harassed will have the confidence to report it. Make students aware that, as soon as they log in to the internet, they are creating a trail of behaviour for which they can be held responsible for the rest of their lives. Every word and image that they share online can potentially be stored and reproduced infinitely and indefinitely. They should be aware of the implications of this in terms of future jobs, college entrance and future relationships. 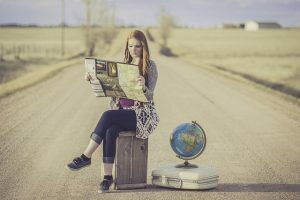 They can use this to their advantage and create a creditable footprint that can help them to build a great reputation and enhance future career prospects, but one single act of poor judgement can also follow them around for the rest of their lives. In all of these instances it is better to educate students about the safe use of digital devices and resources than to ban them. Banning the use of these devices is a denial of our obligations as educators. We may be protecting our school and ourselves from any consequences in this way, but we aren’t helping to protect our students. They have access to all of these resources outside of the school and usually inside it, through their own device, so we must take responsibility for their safety and help to educate them and their parents in a well informed and logical way to the realistic dangers that exist and how to protect themselves and their friends from those dangers. Make sure your students know how to use any reporting or red-flagging features of any site you suggest. Even the most genuine of sites can have comments from users that are inappropriate. Showing students how to flag up or block comments from people that are offensive is a valuable lesson, as well as a good way to help protect them. In part 2 of this series I’ll be looking at what you can do to ensure the links and apps you share with students aren’t putting them in danger. This text has been taken and adapted from my ebook – Digital Tools for Teachers – Trainers’ Edition. Maslow’s Hierarchy of Needs was originally developed by Abraham Maslow in his 1943 paper ‘A Theory of Human Motivation’. 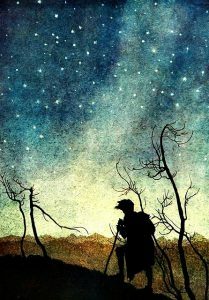 Maslow studied what he called ‘exemplary people’ and looked at how and what motivated them to achieve. His study included Albert Einstein, Jane Addams, Eleanor Roosevelt, and Frederick Douglass. Maslow also studied the healthiest and highest achieving 1% of the college student population. 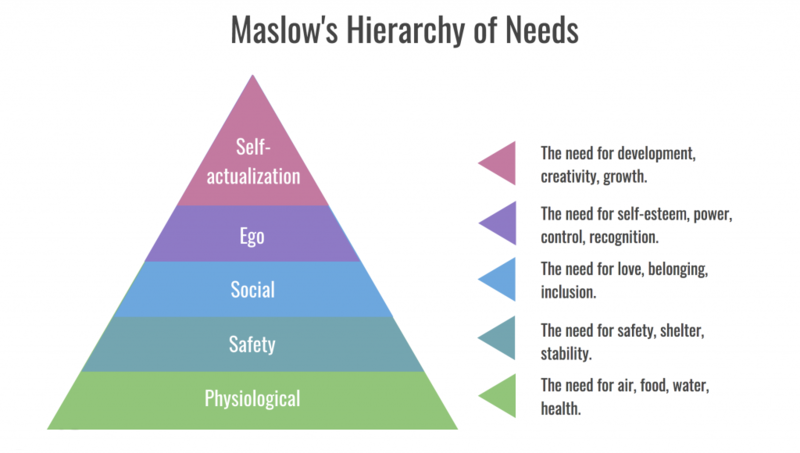 As a result he developed the hierarchy of needs as an attempt to describe what people need in order to achieve a level of fulfilment from their lives or what Maslow describes as ‘self-actualisation’. This hierarchy is divided into five levels usually depicted in the form of a pyramid moving from the sections at the bottom, providing for our basic physiological needs of food and shelter, to the level of ‘self-actualisation’ at the top. 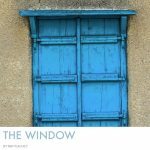 This paradigm is a useful one for education because it can help us to focus on what education is really for – helping students to realise their own potential and lead fulfilling lives – rather than achieving what can be rather abstract syllabus goals. 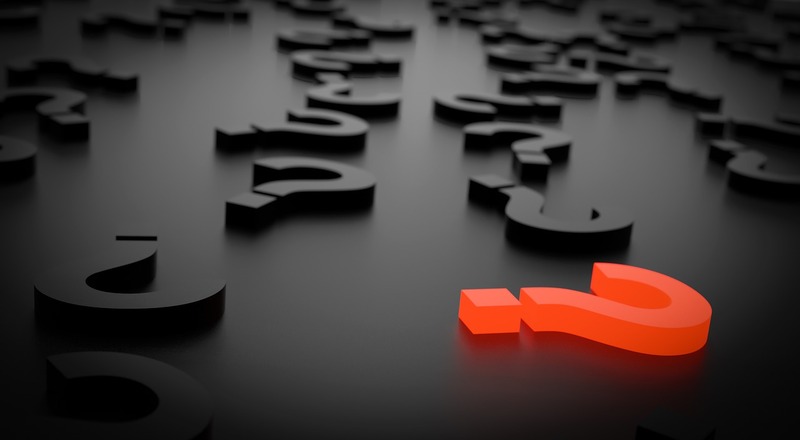 The relevance to educational technology is that it can help us decide which tools we choose to use with our students and how we enable our students to use these tools. It has become a mantra that pedagogy should lead technology rather than the other way around and this is, to a large extent true. Much early implementation of educational technology did focus on using technology as a form of motivational gimmick rather than because it was the best way to achieve a pedagogical goal, but that is not the only truth. Putting the technology into the hands of students and helping them to understand how to use it in a way that leads to their own self-actualisation can also be a perfectly legitimate goal in itself. If we do this though, we should be sure that the technology we teach students about has genuine functionality for them outside of the classroom and measuring this against Maslow’s hierarchy is a good way to do this. Few things divide the opinions of teachers more than the use of technology in the classroom but with more than 20 years of the internet I thought we would have moved on from “Whether?” to “How?” It seems though that I’m mistaken, as France moves to ban mobile devices from their children’s classrooms I’m once again appalled that our education systems can be so out of touch with our students’ day-to-day realities. Both sides in this debate regularly site research or the lack of it to enforce their arguments that technology should or shouldn’t be used, but much of this research is either very small scale and carried out within a very limited context or looks at how technology can be overlaid onto an antiquated approach to transmission teaching that itself has no foundation in research and was only used in the absence of any other approach. So, I feel like common sense should be our guide and here are four reasons why teaching students how to use technology should be a no-brainer. 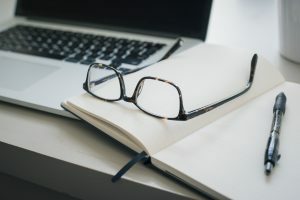 With the vast majority of written discourse being created on digital devices it would seem only natural that we look to digital tools to assist in both the production of a wide range of text based genre and also in the teaching of the sub-skills of writing. In addition to this the move to digital text production has enabled the creation of a number of tools that can assist students in the production of better quality writing and supply them with feedback, guidance and suggestions for improving the quality of their output. Many of these kinds of tools don’t exist in the analogue world of paper-based production, so it is imperative that we as teachers help to educate our students to enable them to get the best from these tools and resources. 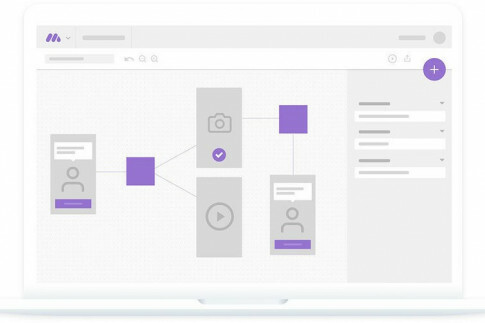 Another significant change that digital text production has ushered in is the ability to produce text collaboratively, both asynchronously and synchronously. 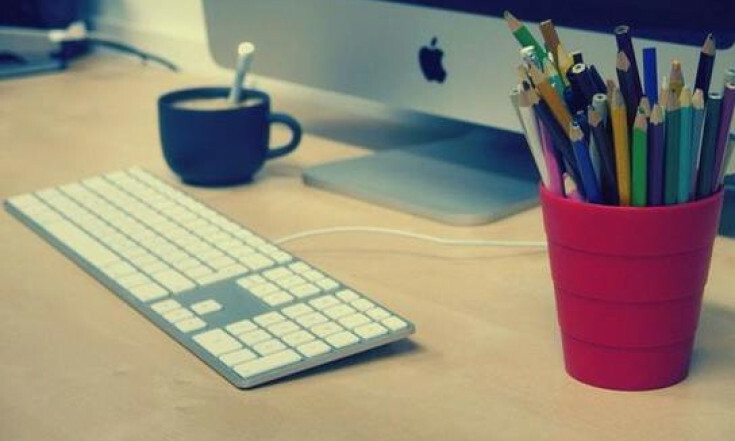 The skills involved in working collaboratively to produce and refine text are becoming increasingly important in todays modern workplace, so again this reinforces the importance of developing students writing skills within the digital realm. 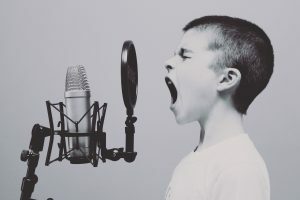 Digital connectivity has brought about a revolution in the way we use voice to communicate both with each other and with the digital devices that accompany us wherever we go. Face-to-face synchronous communication across continents has become a day-to-day experience for many people and the use of voice to control various aspects of our computers and indeed our homes is becoming normalised. 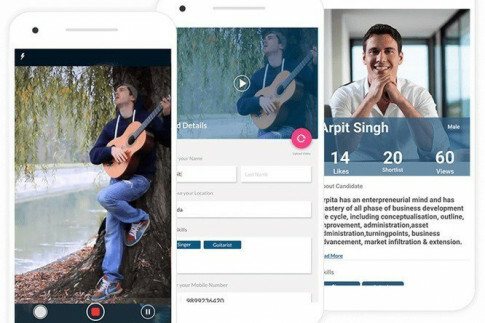 With the falling cost, increased accessibility and use of voice communication tools across continents and cultures it seems only natural that we should be helping our students to access and make use of these tools effectively both inside and outside the classroom. These tools don’t just offer our students the opportunity for genuine language use but they also offer them the opportunity to record and reflect on their own abilities and take a more autonomous and self-aware approach to the development of speaking skills. Despite the proliferation and popularity of video and audio on the internet, the vast majority of what is published and consumed online is still text. Reading from screens, websites and digital communication tools present students with some unique challenges that the more linear, homogeneously sealed environment of paper-based communication doesn’t. 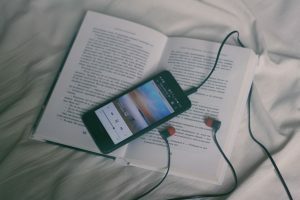 In contrast to the challenges of reading from screen, digital tools also offer a range of functionality to support the reading process and make it more engaging and enriching. 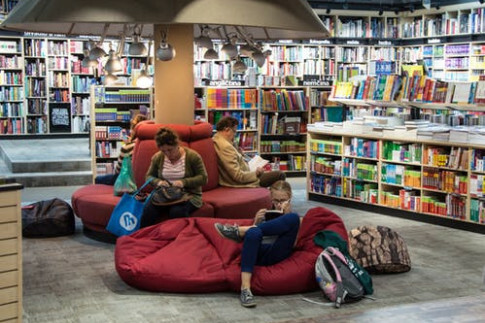 It can also be argued that we now consume text in a very different way on digital devices. We are much more likely to explore background information, take tangental journeys away from the original topic and read across multiple texts and genres during our searches and researches. Developing the skills necessary to read effectively in this new digital environment can only be done using the tools and devices that are native to that environment, so as teachers we need to ensure that we are using a range of digital texts and tools that help students to develop the skills they need to navigate this digital world with confidence. Much like speaking, the digital communications revolution has expanded access to a huge variety of digital genres and with that a range of voices and accents that students would never experience in the analogue classroom. 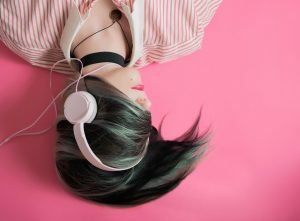 These digital communication tools coupled with the proliferation of mobile devices offer students the opportunity to work more autonomously to develop their listening skills both inside and outside the classroom. Helping students to negotiate the huge range of available tools and use them in a way that enables them to develop their listening and communication skills more effectively should be among the top priorities of language teachers. These four short texts come from my ebook – Digital Tools for Teachers – Trainers’ Edition.